Born in 1972, Russia, Kemerovo. Uzhgorod College of arts and crafts. Erdelli 1990-1993. Lviv Academy of Arts 1993-1999. From 1999-2018 he participated in various Ukrinsky and international exhibitions and plein air. Works are in private collections and galleries in Ukraine and abroad. 2011-personal exhibition "VDokh-novenie" Gallery "Na Korolenko", Dnepropetrovsk. 2012-All-Ukrainian exhibition "Christmas", Central House of Artists, Kiev. 2012-exhibition "Image of equilibrium", art center "Y. Gretera", Kiev. 2012- "Kvіti", gallery "Lemish" m.L'vіv. 2012-exhibition "Big Sculpture Salon", Art Arsenal, Kiev. 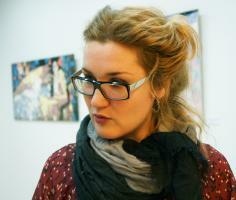 Anastasia Krayneva's personal exhibition "Ultramarine" starts. 2014-charitable exhibition "Heart of the World", Kiev, Ukrainian House. 2015 - personal exhibition "Kaleidoscope of Happiness", Art Gallery Manufactory, Kiev. 2015 - personal exhibition "Between Heaven and Earth", Art Gallery Manufactory, Kiev. 2016-collective exhibition auction "Ukrainian Beauty" Embassy of Ukraine in China, Ukrainian House, Katyusha Gallery, China. 2016-personal exhibition "Taste of Summer", Museum of the History of Kiev, Kiev. 2017- personal exhibition "breath of air", Museum of the History of Kiev, Kiev. 2017-2018 - personal exhibition "The Volume of Colors", LERA LITVINOVA, Kiev. 2018 All-Ukrainian Exhibition "Day of the Artist", Central House of Artists, Kiev.